Was Michael Rockefeller Killed By Cannibals? 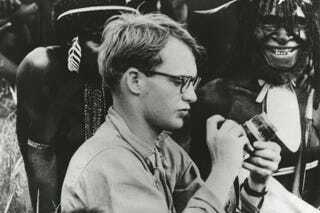 Michael Rockefeller was the son of New York Governor Nelson Rockefeller, and an aspiring ethnographer. In 1961, he disappeared while researching the people of what was then New Guinea in what has become one of history's most intriguing unsolved crimes. Now, a documentary offers evidence that he was killed by cannibals. In 2007, filmmaker Fraser C. Heston (son of Charlton) discovered a lost cache of 16mm film shot by Milt Machlin, the editor of Argosy magazine who coined the phrases "Bermuda Triangle" and "the Abominable Snowman." The footage was taken during Machlin's expedition to New Guinea in 1969 in search of the lost scion, inspired by an eyewitness report that Michael Rockefeller was alive and being held against his will by Stone Age savages. Machlin's New Guinea visits inspired his book, also called The Search for Michael Rockefeller, which was originally published in 1972. Along with Carl Hoffman's recent Savage Harvest: A Tale of Cannibals, Colonialism, and Michael Rockefeller's Tragic Quest for Primitive Art, it remains one of the key works exploring Rockefeller's fate. The film's website describes the doc as being "in the tradition of Grizzly Man," which is an encouraging comparison to say the least. Check out the trailer below.